" The author draw parallels and note disparities between the various core spiritual beliefs and practices of Hinduism, Buddhism, Christianity, mysticism, the occult, Scientology, Theosophy and many of the New Age practices and teachings. Teachers and students or anyone interested in uncovering the secrets behind much of today’s merging spirituality will find this book thought-provoking and inspirational." Moore’s writing opens the mind to almost any possibility – always prepared to ask the unthinkable. Many things once regarded as concrete and ‘right’ are tumbling like a pack of cards. Whether it is our retirement pension or job security, there are very few things that we can be certain about. What you do when a loved one is terminally ill or dies? Where do you go? For many people their world simply falls apart. Whether it is in the scientific or spiritual realm, there are only a few things we can rely on as certain and, even these are decreasing in number. The only things that seem certain today is the increase in the quest for meaning, purpose, spiritual knowledge and self-fulfillment. This is the flip side of the increasing insecurity on the world in which we now live. Naturally, many are turning from orthodoxy to the alternative and the esoteric, as they fail to find answers to their questions in conventional medicine and organised religions. The massive interest in reiki healing, shiatsu, feng shui, yoga, life and fulfillment coaching, and similar energy and New Age methods testify to the hunger of millions for meaning and self-discovery. Secrets Behind the Veil explores all of these and more, taking the reader behind the veil for a deeper, clearer understanding of the higher truths behind the deeper meaning and power of the new healing and self-fulfillment techniques. That it is done so skillfully in one book is testimony to the clarity, precision and richness of the author. 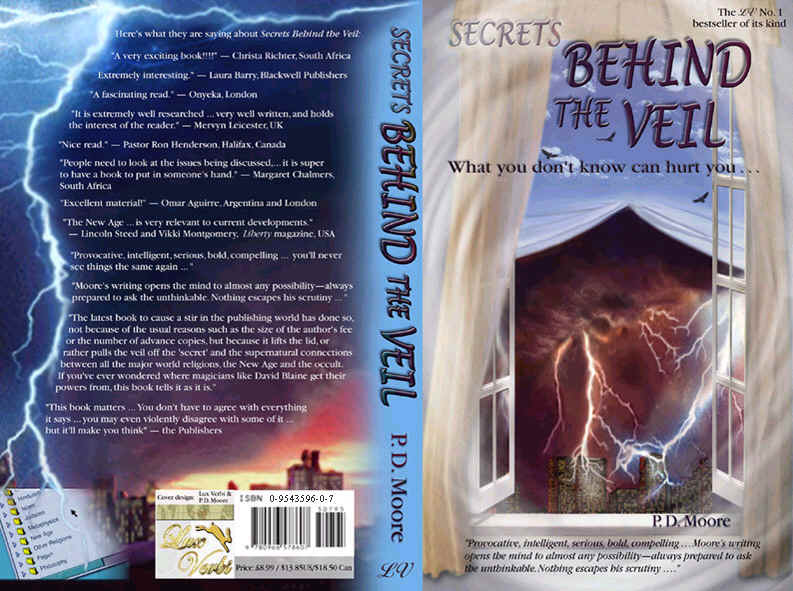 ·Speaking in tongue ·"Toronto blessing"
Secrets Behind the Veil cost only £8.99, and is available from WHSmith, Blackwells, Amazon and all good bookshops. However when you order directly from us you receive the book much quicker when you buy online. You can read sample chapters and reviews here or by following the links lower down this page. The author begins by bringing events right up to date, reminding us that September 11th 2001, taught us that there is still something called ‘evil’. He suggests that our world is heading for a stupendous crisis. What is it? Is there hope for our world, and will a new world order be the means of delivering such hope? This is the work of a man with an original voice, an enlightened perception and something very big to say – things, which are universally true, but no one else dare say so! It contributes a new and richer understanding on some of the more familiar subjects by treating these in an original and stimulating way. At the same time he dispels the many myths associated with supernatural activities, penetrates areas of ignorance and explains in the most remarkable way the nature and power of the New Age in all its varied forms. There are twists and turns in almost every other line. The time is now right, for what this book has to say. It is inspirational – a can’t stop till you get to the end kind of book. And for those who already know something of the New Age, this book will ripen your understanding. An original work. This new book by the latest writing sensation, Philton Moore, cannot be hyped – it is so real, so pulsating it gets you going. P.D. Moore’s other mind, body, spirit title is called Yoga is powerful (ISBN 0-9543596-1-5) is due out in 2003. As is his intriguing work Another Look at Death – inveigling the mysteries of the afterlife, reincarnation, & the destiny of the soul (ISBN 0-9543596-2-3). He is also completing a children’s book in response to Harry Potter. What Every Kid should know about Harry Potter (ISBN 0-9543596-3-1). His two other books - European Union Law and Social Policy, and Local Government Housing Law are also nearing completion. Lux-Verbi Books PO Box 556, Enfield, Middlesex EN1 3ZJ United Kingdom.